Just like they say, ‘more species, more problems’…well, we’ve got lots of problems. The minnow family—Cyprinidae (Sy-Prin-I-Dee)—is the largest freshwater fish family in the world, boasting over 3,000 species from ~370 genera. All small fishes are minnows. Over the years, the term ‘minnow’ has become a colloquial expression for any small fish in any waterbody. 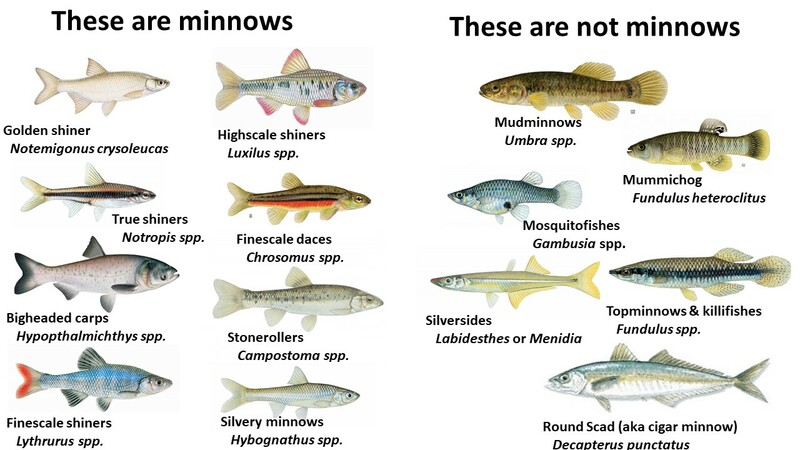 A few freshwater non-minnow species even have the word ‘minnow’ in their common name—for example mudminnows and topminnows, which are in the families Umbriidae (Um-bri-dee) and Fundulidae (Fundulidae, Fun-doo-li-dee), respectively. Other small and silvery fishes can resemble minnows including silversides (Atherinopside Ath-er-in-ops-i-dee) or even small shads (of the herring family Clupeidae, Clu-pee-i-dee). Carps are suckers. 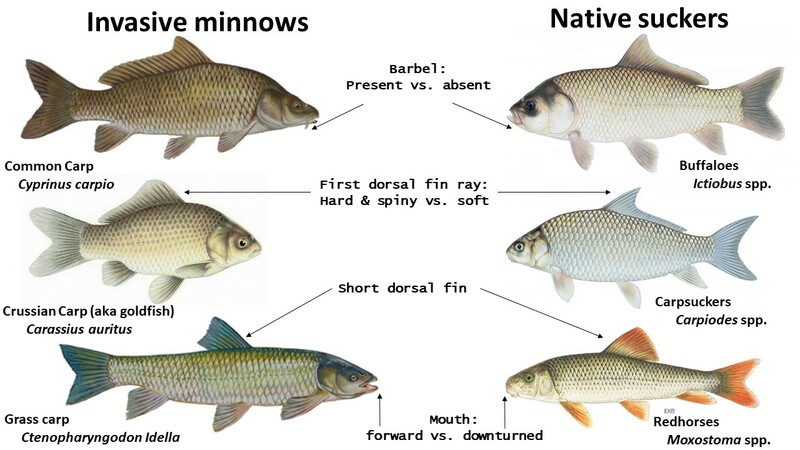 Actually, carps are minnows, and suckers are members of an entirely different family: Catostomidae (Cat-O-Stom-I-Dee). However, because they do share some common ancestry, carps can resemble some sucker species such as buffalos or Quillback. Both have robust bodies, goldish brown color, and thick scales. However, Common Carp and Goldfish both have hard and spiny first dorsal rays (all suckers do not). Common carp also have a barbel (all suckers do not). Grass carp may also superficially resemble some Redhorse species because they are elongated. However, redhorses have downturned (inferior/subterminal) mouths while Grass Carp have straight (terminal) mouths. Marine minnows. Most species of true minnows cannot tolerate high salinity, although some can survive in brackish zones—that means there are no true marine minnows. 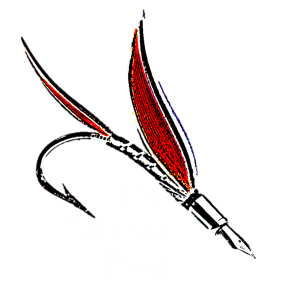 Yet, ‘minnows’ are a very popular baitfish in coastal fisheries. These species, usually sold live, are typically Mummichogs (a killifish, family Fundulidae). ‘Cigar minnows’ are another popular baitfish among marine anglers; these are usually caught live and used in bottom fishing. However, these species are actually Round Scad, and belong to the family Carangidae (Ca-ran-gid-ee)—along with pompanos, jacks, Lookdowns, etc. Minnows, shiners, and chubs—what’s the difference? Those are just words that have been interchanged among genera as general terms for different minnow species. For instance, common names of numerous species in the same genus end with ‘minnow’, ‘shiner’, or ‘chub’. 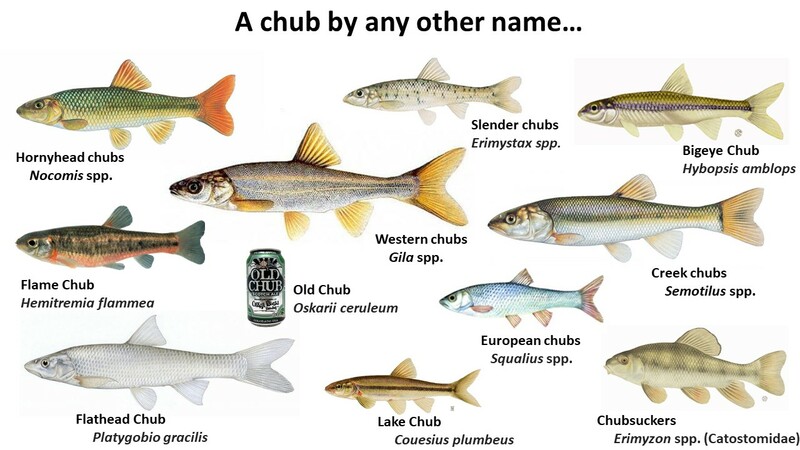 However, there is a genus of ‘true chubs’ (Nocomis) and ‘creek chubs’ (Semotilus). And…if you can think of any other strange cyprinid scenarios or misplaced minnow misconceptions…just let minnow. Reblogged this on Confessions of an Adult-Onset Hunter. I am curious if Desert pupfish (Cyprinodontidae) are true minnows?